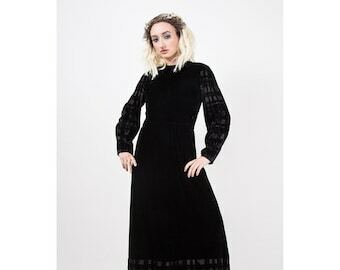 Gorgeous vintage 1930s bias cut crushed rayon velvet gown in a rich shade of chocolate brown. Sleeveless with little flutter cap pieces at the shoulder, self button front, dramatic low draped back, attached self belt, and full bias cut skirt. Crushed velvet is mitered in the skirt creating a beautiful silhouette. Side snap closure. Gown has a few small issues, please read full notes below. All VAT/customs fees are the sole responsibility of the buyer. Condition: Good. One vertical tear that was hand tacked in place on the front by the neck. Gown originally had long sleeves but were completely trashed, sleeves were removed and arm scythes were turned under and sewn.